Catastrophic injuries are life-altering and irreversible to say the least. Personal injury lawyers often represent victims of auto accidents and other incidents that lead to catastrophic harm such as severe brain injury and damage to the neck and spinal cord. You’ve seen firsthand how devastating the impact that can have on someone’s life. 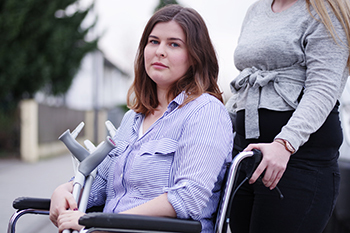 While you work tirelessly to help your injured clients, Legal Capital Corp can give them fast financial assistance to get through day-to-day life while coping with their new disability. An attorney or their client contacts us and provides basic information on the catastrophic injury or another type of personal injury case. We review critical documents of the injury and case details, then immediately decide whether or not your client’s catastrophic injury claim qualifies for a cash advance. Your client agrees to our offer and has money in hand within 24 to 48 hours. Why Choose Legal Capital Corp for Pre-Settlement Funding? One of the benefits of choosing Legal Capital Corp is that we don’t require attorneys to fill out applications. We ask for a few documents and continue the process from there. Medical expenses for catastrophic injuries are ever-growing, and some injuries such as partial or full paralysis involve making home modifications. When it comes to the amount of funding we offer your client, we encourage modest cash advances that will cover their basic financial needs in the present. Legal Capital Corp prides itself on offering transparent, low, flat-fee financing that doesn’t involve complex interest rates. We believe in being upfront about the actual cost to your client. Cases that are resolved within nine months of the cash advance pay a $600 fee, and we’ve placed a cap of $1,500 for claims that exceed nine months. We work hard to earn and maintain trust with the attorneys we work with by building a relationship based on integrity and honesty. There are no unnecessary fees, and the process is simple and easy to understand. We work quickly to get your client what they need to cover day-to-day expenses and costs of living. If you have a client who has suffered a catastrophic injury due to someone else’s negligence, please contact Legal Capital Corp in Chicago today at (312) 204-7939 or fill out our online application. We provide pre-settlement funding within 24-48 hours of acceptance and serve clients in Chicago and nationwide.